Our state of the art machinery allows us to quickly create unique parts in an assortment of sizes to match your needs. Machines such as our Mazak Nexus 350-II MY allow the "done in one" approach of completing many parts using a single setup. 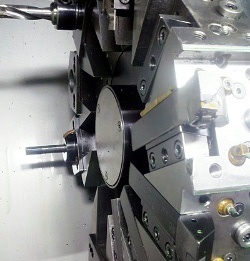 If you have more specific requirements for milling, lathe work, cut-off, press or E.D.M. just give our team a call to discuss how we can best assist you with your project. For specifics on the size capacity of individual machines have a look at our brochure.